We are official at the halfway point in the beer advent calendar. It’s been quite an interesting experience thus far. Lots of opportunity to try unique beers, and only halfway done! That means 12 more beer to go! Fantastic! Today’s beer comes to us from Big Sky Brewing Company in Missoula, Montana. This is the second American beer we’ve come across in the calendar. Big sky was started by Neal Leathers, Bjorn Nabozney, and Brad Robinson. It all began with Brad and Neal, home brewers since the 80s, when they first came together they began producing a series on their local cable access station called “Beer talk”. It was a show about Brad and Neal tasting various beers and commenting on what they liked and did not like. This brought attention to the duo and showed their passion for beer. Sadly neither of them were business savvy. That’s where Bjorn came in. Neal started brewing test batches while Bjorn and Brad raised the capital. After about a year and a half, Big Sky Brewing was officially ready to open its doors. They brewed their first batch of beer, Whistle Pig Red Ale, in mid-June of 1995. They started out as a draft only brewery but today they are one of the 50 largest breweries in the U.S. selling a total of over 46,500 barrels (2.5 million 6 packs) of beer a year. They sell in over 24 states so it’s a beer you might be likely to run across. The beer we are trying today is not one of their standard brews. It’s a seasonal beer (not to be confused with the style) that they bring out only around this time of year. 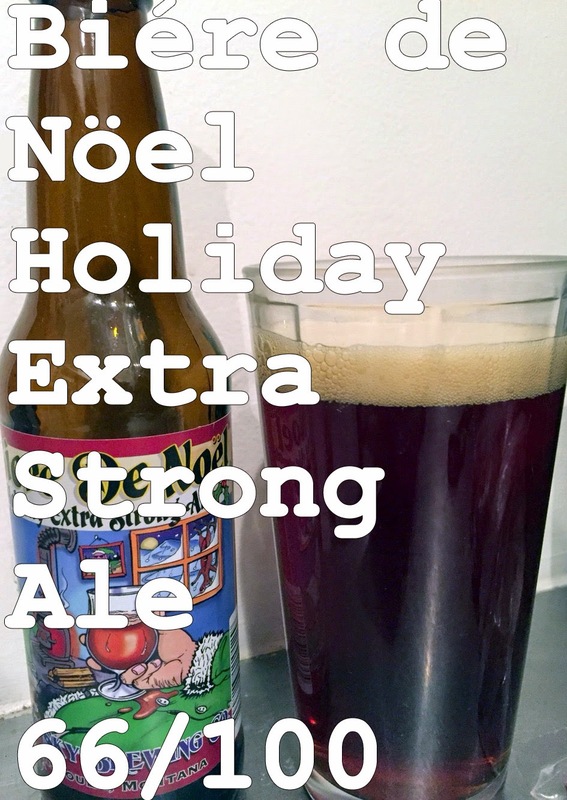 It is the Biére de Nöel Holiday Extra Strong Ale. This is a limited edition beer from the company brewed in the style of a Belgian Dark Ale. It sits at about 10.13% alcohol/volume. Belgian Darks offer a really wide range of characters. The colours can be in a variety of hues from amber to light brown to deep garnet. Flavours range between dry and spiced to sweet and malty. Most usually have low bitterness but this one comes in at a pretty good 35 IBU (international bittering units). The average IBU of IPAs (the hoppier style of beers) come in at the 40+ range. I’m pretty excited to give this one a try, so let’s get to the beer! Appearance: Amber brown with 1” of head that retains very well. Cloudy with some signs of possible sediment. Smell: Very sweet smell. Malts come through strong giving a caramel aroma with slight berry notes and the distinct smell of alcohol. Taste: Sickly sweet with a strong alcohol after taste. This is clear a strong ale as the taste is somewhat overwhelming. Malts are clearly noticeable and add to the sweetness of the beer. Flavours are limited by the overtone of the alcohol leaving a bitter aftertaste that isn’t wholly pleasant. Overall: When brewing, alcohol is created by the yeast digesting the sugar in order to create alcohol as a by-product (among other things). Many strong ales have this trouble of being overly sweet with a strong alcohol after tone that overshadow any of the malts or hops used in the brewing process. Good ones can balance this out creating a flavourful enjoyable brew. Sadly, this one was not able to do so and the alcohol and sickly sweetness of the sugar and malts overwhelmed any other flavours. Do I like it: There are many good examples of strong ales that are balanced and provide a full flavour beer that is still strong in alcohol. Sadly, this beer was not very balanced and was not really that enjoyable. I found myself cringing at the sweetness combined with the alcohol after tone. This is not a beer I would buy. Would you spend $3K on a pet?